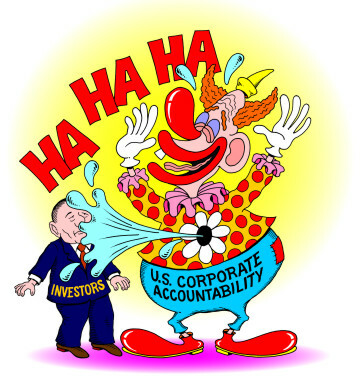 More than any other word, “accountability” has become the keyword defining the past quarter-century in private and public sectors of life in America. Presidents, governors, and mayors say that they answer to voters. CEOs and top managers proudly display their accountability to their boards of trustees. Small and mid-size owners of companies know that they are accountable to their customers. Appointed leaders and bureaucrats point to the outcomes they must meet in their evaluations. Or pay the consequences. So let’s call these political, market, and bureaucratic forms of accountability. Anyone in K-12 or higher education knows that accountability is (and has been for decades) the magic word that opens doors for aspiring leaders and shows the exit to low-performing employees. For these institutions, “accountability imposes six demands” on educators at all levels that overlap these different versions of the accountability pervasive in the U.S. There are, then, political, market, and bureaucratic forms of accountability across private and public sectors in the U.S. including K-12 education. 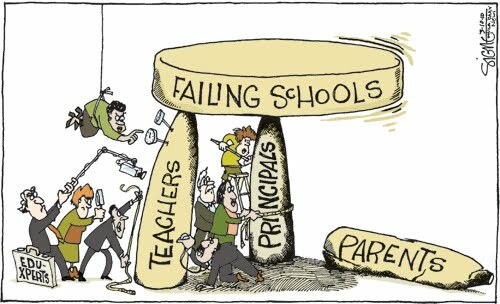 Schools are political inventions approved by voters and taxpayers charged to carry out national and individual goals; with parental choice readily available a version of customers buying in a market economy has developed in U.S. schooling, and, well, for bureaucratic accountability, K-12 schools in urban, suburban, and rural districts are hierarchical, rule driven, and constantly reporting to superiors as well as being evaluated. I found a sampling of cartoons that illustrate humorously and, at times, harshly, various features of accountability across public and private institutions. If readers come across other cartoons that cause chuckles or pinch (or both) on the different forms of accountability, please send them along. Some of these are funny, but I’m disturbed at those that target parents because there already is a false idea that any sort of “achievement” (read: opportunity) gap is the fault of lazy, unmotivated parents, especially those who are poor or of color. Of course, most opportunities for family involvement in schools are not scheduled in a way to make them accessible to parents or guardians who are working multiple jobs, working evening jobs, can’t afford child care, don’t have transportation. 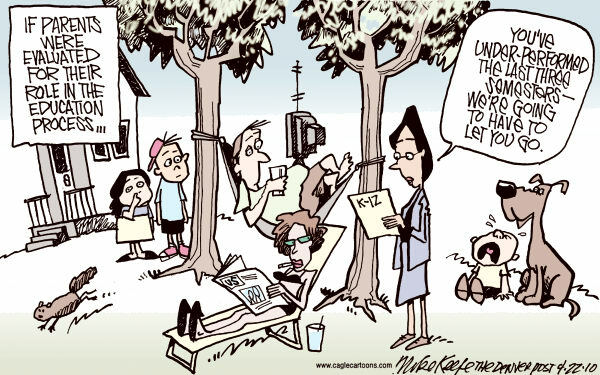 So I’m afraid that some of these cartoons represent, to me, a society with its proverbial head in the sand. Let’s give all families access to living wage work, then we can talk about whether they show up to parent teacher conferences. Anyway, I’m really surprised that you would include cartoons here that may contribute to the deficit ideologies that pin a mythical school “failure” on either kids or parents when you know (because you’ve written about it) that this sort of thing actually contributes to the neoliberal thinking that drives the education reform conversation today. Thank you for taking the time to comment on both posts. 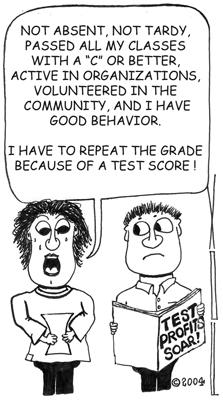 I included a range of political cartoons on accountability, knowing that particular ones would bother people, to illustrate the continuing deep-set social beliefs that drive test-driven reforms. What you label “neoliberal thinking” are beliefs about parents and students that are embedded in decision-makers’ thinking. My point was to show those beliefs through varied cartoonists’ eyes. Thanks Larry. I wasn’t clear on the fact that you purposefully were including these various views. I agree, Paul, that the parody intended in political cartoons offer insights into, and criticism of, mainstream beliefs. 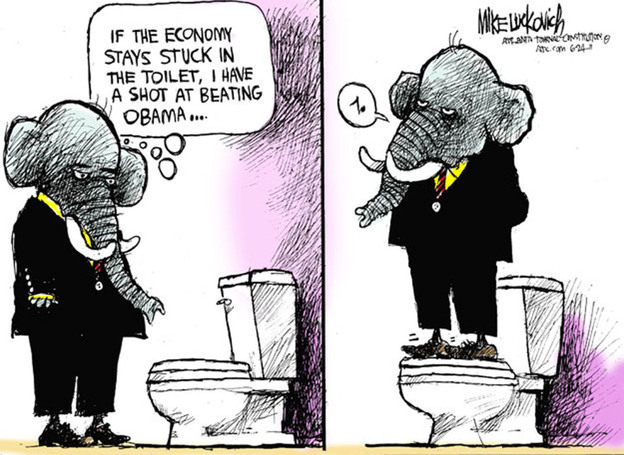 As a teacher in high school and graduate school, I used political cartoons for both purposes. The CEO’s severance package cartoon, for example, caricature’s a business practice that continues to be defended in many newspaper editorials and corporate offices. I am a former school administrator in Orange County. 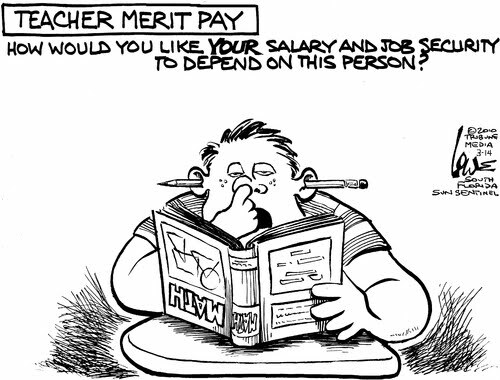 The cartoon that suggests that teacher’s will not receive merit pay because of “dumb” students was disturbing. I believe that merit pay, or any other school reform that would try to improve the progress of students would be helpful. I try to help enforce these policies, and the cartoon clearly shows that these policies are, somehow, ineffective. Thanks for commenting on the one cartoon that disturbed you. Thank you, Zane, for your comments. I do not know of “research that supports merit pay.” Merit pay plans vary greatly. Better tell me what kind you mean.